As a mom on the go I eat a lot of fast food which I noticed was starting to catch up with me, so I started looking into ways to cut the pounds but not have to change much in my life style. Balance Bars were my answer. So with my Walmart gift card in hand I headed over to Walmart to stock up on my new mommy diet. I was amazed at just how many flavors I could pick from. Did you know Balance Bars come in 20 different flavors! A lot of the flavors are chocolate, yes CHOCOLATE! I personally love the Cookie Dough and the Dark Chocolate Caramel Macchiato. The reason Balance Bar has its name is because it is perfectly balanced with 40% Carbohydrates, 30% Protein and 30% Dietary Fat which helps fill you up and gives you energy that lasts through your daily activities. 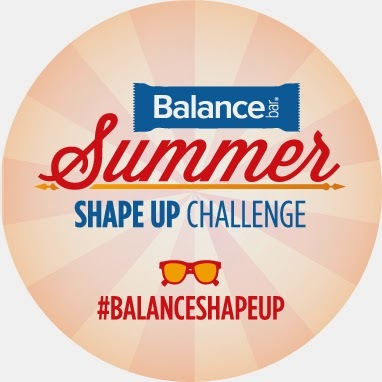 To make things even better right now you can join the Balance Bar Summer Shape Up challenge which is a 40 Day Challenge filled with 30-minute workouts, healthy eating tips and multiple social media giveaways. Now I have my mommy diet and can kick myself in rear to get out there and exercise. I also found out from the challenge that it helps to have others join you so it makes doing the work outs more like fun outs : ) your not thinking of the pain because your enjoying the friends. What are you waiting for why not join. “Like” Balance Bar on Facebook and Follow Balance Bar on Twitter so you can keep up with everyone on their weigh lost journeys and learn some helpful tips. Enter to win a $10 Gift Card to Walmart and a Variety Pack of Balance Bars. Open to U.S. residents only, contest will end August 15, 2014.